Today we’re making our own Patterned Paper Flowers – talk about fun! All you need is the ability to do a little doodling. Well, and a stamp set to start with…the Bokeh Dots set makes this easy. Okay, you need something to color with. But that’s all, right? Watch the video below or click HERE to watch in HD on YouTube. I just love the funky loose style of this bouquet of paper flowers! 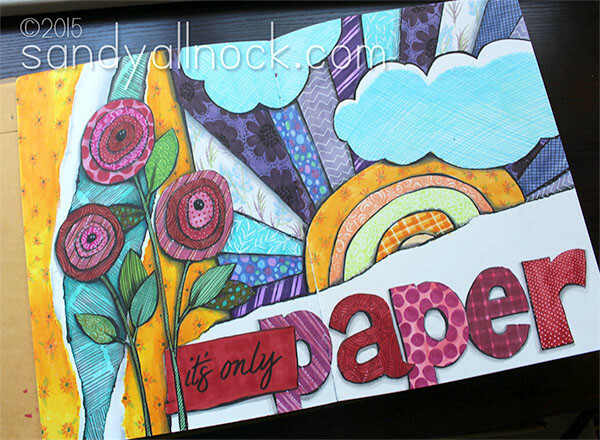 In the video I promised a look at the art journal page that came before the card. It’s done in Copics in THIS art journal – and yes the marker does bleed through. I just use every other spread. 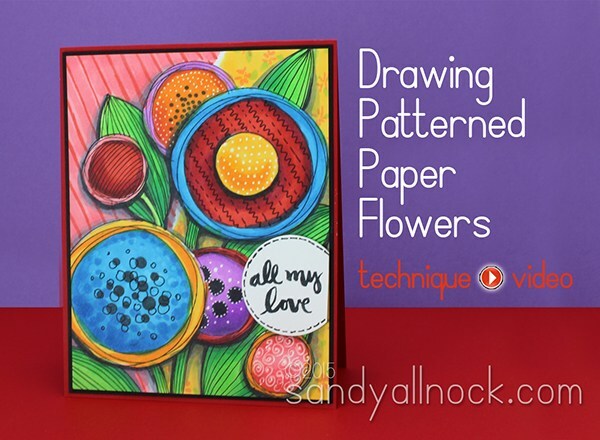 And a crazy question: is it patterned paper or designer paper flowers? I tend to use patterned more….but what do you call it? Just was stopping by to say…Your TERRIFIC! Watching your video and seeing your creativity from beginning to end is awesome. Thanks for sharing your talent. WOW wow wow!!! You blow me away with all these amazing creations……coloring is YOUR special talent and I thank you for sharing it with us ALL!! I’ve just recently discovered you. I doodle and color and paint all the time, so watching your videos is just so amazingly fun. I learn AND i get inspired – a perfect match. thank you so much for being such an expert and sharing your talent with all of us! you are amazing! I can’t wait to turn my next flower doodle into patterned paper. I will have to try it with watercolors as well. Sandy, you outdid yourself again! I am really intrigued by Zantangles and I always loved playing with the spirograph as a child, I may have to buy me a new one to play with as an adult. 🙂 I am definitely going to try this technique! Thanks for the inspiration! LOL. How about Designer Patterned Flowers? Whatever name they are fun and colorful. I love how your creative mind flows as you “doodle”. I never tire of the magic that unfolds with each of your videos! WOW! I was just mesmerized as I watched you at work. I would love to try this sometime. Thanks for sharing it. wow…wow…wow… I love this it looks so fun!!! I could watch you color all day…you have such a great talent. Seriously awesome card! Love it! OK, now you’re getting simply ridiculous. LOVE this! What a fun creative artpiece. I’m headed off to my craftroom right now and breaking out the Copics and the bokeh stamps in my stash. Thanks for the lesson in “c” shading. Hmm, what do you call it? I guess I call it doodling or drawing. Either way, yours are GORGEOUS!!!!! This makes me happy! Thank you! Sandy, you are such an inspiration! I love your work and how you teach us new techniques. Today is a relaxing day for me and I plan on going through the last weeks worth of videos, and then playing with the technique that I learn. Thank you so much for your time and effort that you put into these for us. As Cheryl said, it is truly “a special treat this Friday”. Thank you! Thanks Sandy. Lovely technique. Certainly would be a stress buster since coloring is relaxing for me. Much appreciated video. Oh, Sandy, I LOVED the video, and what fun! It seems like it would be so relaxing to just Zentangle-ish and color! Thank you so much for sharing your gifts! This is a special treat this Friday! Hugs! Awesome work. I say patterned. Awesome work! I might call it designer paper just because of the free form “out-of-the-box” design… Whatever you want to label it the end result is fantastic! I enjoy your videos and great tips and explanations!! My Goodness! It’s a gray and rainy day here in KY, and all this beautiful color is just what I needed to start my day with happiness! Thank you for making this video so instructional, also. It’s an inspiring tonic for the eyes and brain. I go back and forth between pattern paper and designer paper. Sandy, LOVE your card! You make it look so easy to make take a simple stamp set and turning it into a master work of art. I like your video explaining the “c” shape of shading. Wonderful! I’m getting my colors right now…. It’s a great example of contrast. Thank you. 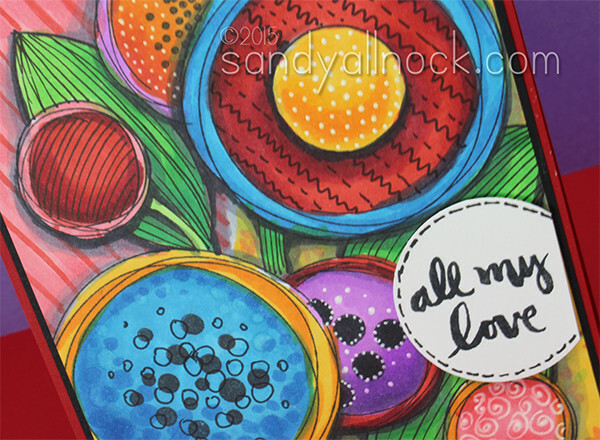 Oh my, this is such a fun project, Sandy! I had actually been contemplating using my new Bokeh set to create some flowers (and colour along with Kathy), but I had never envisioned anything like your creation.